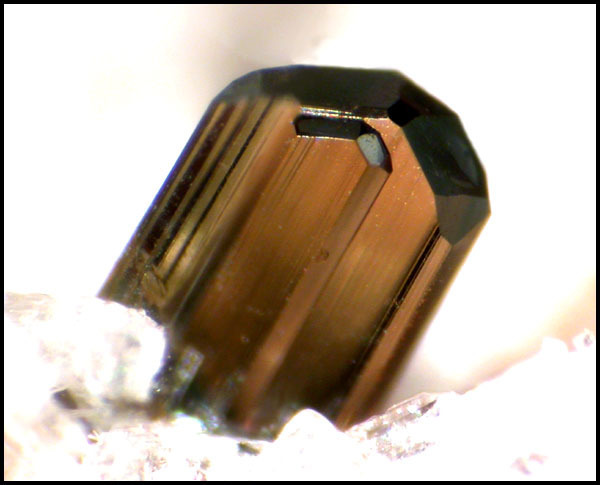 Bronzite: Mineral information, data and localities. Named for the bronze-like submetallic luster on the characteristic cleavage surfaces. 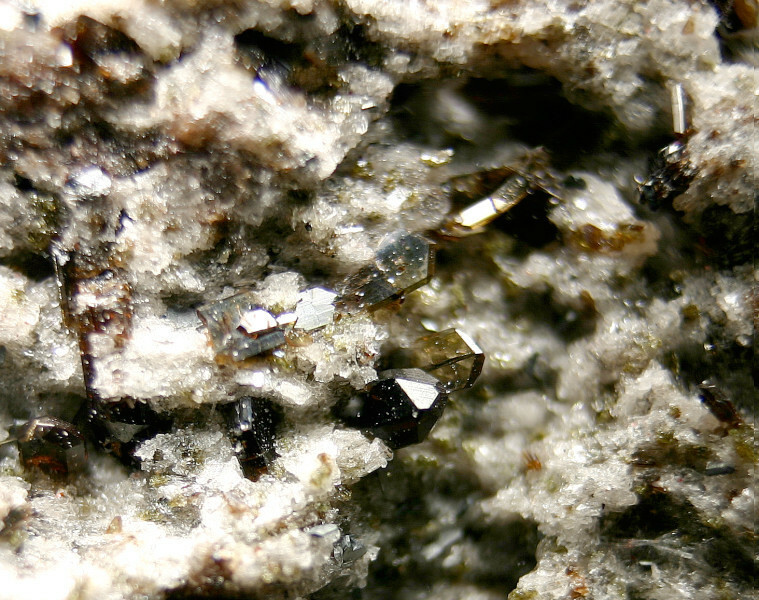 An iron(II)-bearing variety of enstatite. The iron-dominant member is ferrosilite. See also the obsolete hypersthene, a mid-way member between enstatite and ferrosilite. 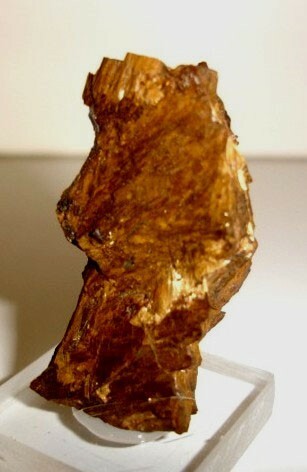 Visit gemdat.org for gemological information about Bronzite. Olivine 47 photos of Bronzite associated with Olivine on mindat.org. Meteoritic Iron 43 photos of Bronzite associated with Meteoritic Iron on mindat.org. Iron 4 photos of Bronzite associated with Iron on mindat.org. Hypersthene 3 photos of Bronzite associated with Hypersthene on mindat.org. Magnetite 1 photo of Bronzite associated with Magnetite on mindat.org. Enstatite 1 photo of Bronzite associated with Enstatite on mindat.org. Frisillo, A.L. and Barsch, G.R. (1972): Measurement of single-crystal elastic constants of bronzite as a function of pressure and temperature. Journal of Geophysical Research: 77: 6360-6384. The following Bronzite specimens are currently listed for sale on minfind.com. The Nallah Meteorite, Western Australia; G McCall and W Cleverly; Mineralogical Magazine, May 1969 pp 286-287. Canadian Mineralogist, Vol. 17, 1979, pp. 635-638.; I. H. Campbell and P. R. Kelly (1978) The Geochemistry of Loveringite, a Uranium-Rare-Earth-Bearing Accessory Phase from the Jimberlana Intrusion of Western Australia. Mineralogical Magazine 42:187-193. New Stony Meteorite Finds Including Two Ureilites From The Nullabor Plain, Western Australia; G. McCall and W Cleverly; Mineralogical Magazine, Mar 1968, pp691-716. New Stony Meteorite Finds Including Two Ureilites from The Nullabor Plain, Western Australia; G. McCall and W. Cleverly; Mineralogical Magazine, Mar 1968, pp691-716. Hamlyn, P.R. (1975) Chromite alteration in the Panton Sill, East Kimberley Region, Western Australia. Mineralogical Magazine, 40, 181-192. McCall, G. J. H., Wiik, H.B. & Moss, A. A. (1966). The Petrology of the Mount Padbury Mesosiderite and its Achondritic Enclaves. Mineralogical Magazine 36(276): 1029-1060. (Dec 1966). Trommsdorff, V., and Wenk, H.-R. (1968): Contributions to Mineralogy and Petrology 19, 158-168. Niedermayr, G. (1993): 931. Erythrin und Malachit sowie Adular, Cerussit, Galenit, Ilmenit, Quarz, Turmalin und Bronzit aus dem Stadtwald bei Rottenmann, Steiermar. Pp. 287-288 in NIEDERMAYR, G., F. BRANDSTÄTTER, B. MOSER, W. H. PAAR, W. POSTL, J. TAUCHER & H.-P. BOJAR (1993): Neue Mineralfunde aus Österreich XIIL. Carinthia II, 183./103. : 265-290. Candia, M.A.F., and Gaspar, J.C. (1997): Mineralogy and Petrology 60, 27-40. Mundt, J. The EKATI–Kimberlite–Diamond–Mine in Canada. Thomson, M. L., Fleet, M. E., & Barnett, R. L. (1981). Amphiboles from the Renzy Lake ultramafic complex, southwestern Quebec. Can Mineral, 19, 469-477. Wang, D., Ouyang, Z., and Cao, J. (1977): Geochimica 4, 288-296. Kratochvíl, F.: Příspěvek k petrografii českého krystalinika. In Sborník geologického ústavu Československé republiky, 1947, sv. 14, s. 449-536. Bernard J. H. et al. Mineralogie Československa. 2nd Ed. Academia, Prague, 1981. p. 68. Welser, P.: Unikátní výskyt ortopyroxenitu u Bohouškovic nedaleko Křemže. Minerál, 2007, 15, 2, 132-135. Čech, V., Koutek, J.: Geologické a genetické poměry ložisek železné a niklové rudy u Křemže v jižních Čechách. In Sborník Státního geologického ústavu Československé republiky, svazek 13. Praha: Nakladatelství Československé akademie věd, 1946. s. 1-22. ĎUĎA, Rudolf a Petr PAULIŠ. Opály Slovenské a České republiky a možnosti jejich sběru. Vyd. 1. Kutná Hora: Kuttna, 2006. ISBN 80-86406-41-5. Str. 72. Econ Geol (1986) 81:1126-1136; Halkoaho, T.A.A., Alapaieti, T.T., and Lahtinen, J.J. (1990) The Sompujärvi PGE Reef in the Penikat layered intrusion, northern Finland. Mineralogy and Petrology: 42: 39-55. FORESTIER F. H., LASNIER B. (1969) – Découverte de niveaux d’amphibolites à pargasite, anorthite, corindon et saphirine dans les schistes cristallins de la vallée du Haut-Allier – Existence du faciès granulite dans la massif Central Français, Contr. Mineral. And Petrol. 23, pp. 194-235. Tschermak, G. (1884,1885). Die Mikroskopische Beschaffenheit Der Meteoriten. Schweizerbart'sche Verhandlung: Stuttgart. Hentschel, H. (1960): The Breitscheid meteorite. III. Petrographic investigation. Geochimica et Cosmochimica Acta 17, 323-338. Dabitzias, Spyros, 1980, Petrology of the Vavdos Cryptocrystalline Magnesite Deposits, Chalkidiki Peninsula, Northern Greece, Economic Geology, 75, 1138-1151. Baldanza, B. (1965) Italian meteorites. Mineralogical Magazine, 35, 214-232; Baldanza, B., Levi-Donati, G.R., and Lewis, C.F. (1970) The Borgo San Donino meteorite: mineralogy and chemistry. Meteoritics, 5, 3 (September 30), 137-148. Grisotto, M., Grisotto, L. & Glasow, El. (2016): Pyrop und Bronzit aus dem Ultental, Südtirol. Lapis, 41 (10), 55-58; 86 (in German). M. Yamaguchi (1961) Mem. Fac. Sci., Kyushu University, Ser. D, Geology, 10, 2, 233-245. Field, M., Stiefenhofer, J., Robey, J., and Kurszlaukis, S. (2008): Ore Geology Reviews 34, 33-75. Mason, B. (1968): Contributions to Mineralogy and Petrology 19, 316-327. Augsten, R. (2014): Peridot-das "grüne Gold" vom Nordfjord. Lapis. 39 (11), 12-20. Holtedahl, O. (1953): Norges Geologi. Norges Geologiske Undrsøkelse. 164, Bind I.
Jean-Clair Duchesne ed. (2001): The Rogaland Intrusive Massifs - an excursion guide. NGU Report no. : 2001.029. Duchesne, J.C. (1999): Mineralium Deposita 34, 182-198. Fournelle, J., Carmody, R., & Daag, A. S. (1996). Anhydrite-bearing pumices from the June 15, 1991, eruption of Mount Pinatubo: geochemistry, mineralogy, and petrology. Fire and Mud: Eruptions and Lahars of Mount Pinatubo, Philippines, 845-862. Karwowski, Ł., Kusz, J., Muszyński, A., Kryza, R., Sitarz, M., Galuskin, E.V. (2015): Moraskoite, Na2Mg(PO4)F, a new mineral from the Morasko IAB-MG iron meteorite (Poland). Mineralogical Magazine, 79, 387-398. Orsoev, D.A. [Орсоев, Д.А.] (1985): Mineralogy of copper-nickel ores of the Lovnoozero deposit (Kola peninsula) [Минералогия сульфидных медно-никелевых руд Ловноозерского местророждения (Кольский полуостров)]. Candidate's degree thesis, USSR Academy of Sciences, Apatity, 253 pp. (in Russian); Orsoev, D.A., Kanakin, S.V., Pakhomovsky, Ya., Ushchapovskaya, Z.F., Reznitsky, L.Z. (2016): Mineral CuFe2S4 from Sulfide Copper–Nickel Ores of the Lovnoozero Deposit, Kola Peninsula. Geology of Ore Deposits, 58, 579-585. Allen, J.B., Deans, T. (1965) Ultrabasic eruptives with Alnöitic-Kimerlitic affinities form Malaita, Solomon Islands. Mineralogical Magazine 1965 Vol.34(268) 16-34. Lionnet, M. D., & Lomberg, K. G. (2007). The application of facies classification in evaluating the Merensky Reef at Bafokeng Rasimone platinum mine, South Africa. Journal-South African Institute of Mining and Metallurgy, 107(1), 37. B. Azambre et al. , Bull. Minéral; , 1987, 110, pp. 379-396. Stalder, H. A., Wagner, A., Graeser, S. and Stuker, P. (1998): "Mineralienlexikon der Schweiz", Wepf (Basel), p. 149. J.B. Dawson, Journal of Petrology, 2002, V 43, N° 9, pp. 1749-1777. Hanks, Henry Garber (1884), Fourth report of the State Mineralogist: California Mining Bureau. Report 4, 410 pp. : 178; Murdoch, Joseph & Robert W. Webb (1966), Minerals of California, Centennial Volume (1866-1966): California Division Mines & Geology Bulletin 189: 307. Whitfield, J.E. (1890), Analyses of six new meteorites: USGS Bulletin 60: 114; Murdoch, Joseph & Robert W. Webb (1966), Minerals of California, Centennial Volume (1866-1966): California Division Mines & Geology Bulletin 189: 307. Pemberton, H. Earl (1983), Minerals of California: 59. Meteoritics, vol. 11, June 30, 1976, p. 111-130. Smith, Lawrence J. (1877) American Journal of Science, 3rd. series, Vol. XIII: Article XXIV: 211. Farrington, O,C. (1915). Catalogue of the meteorites of North America: Memoirs of the National Academy of Sciences, Vol. 13: Washington. 545 pages. Farrington, Oliver C., Catalogue of the meteorites of North America, to January 1, 1909. Smith, J.L. (1877) A description of the Rochester, Warrenton, and Cynthiana meteoritic stones: American Journal of Science, 3rd series., vol. 14: 219-229. British Museum specimen (BM 1981,134).